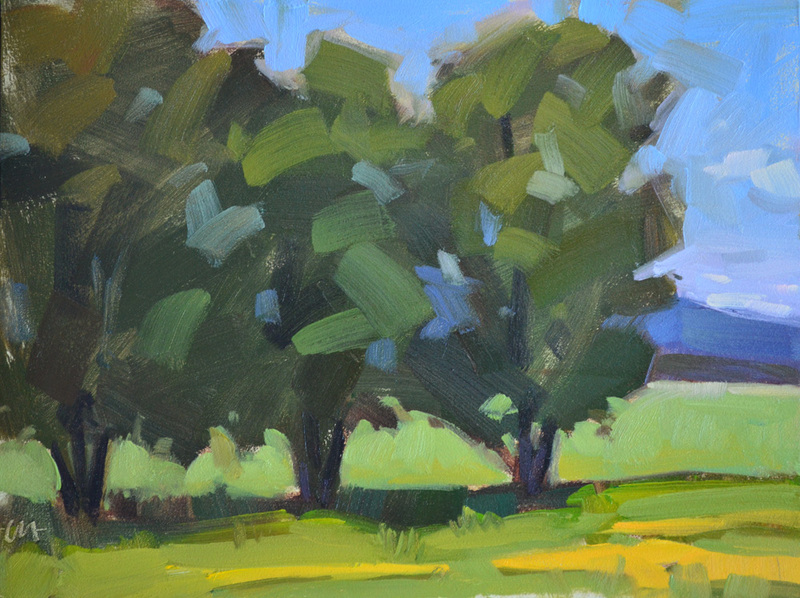 This is another plein air landscape from here in Germany that I'm happy with. I've been working on trees, and the whole tree/sky transition. The thing that is SO different about plein air from still life is - with still life I do all the editing in real life (move the apple here, turn it around, etc. until it looks good) but outside I must make up a better scene out of my head ... but then I have nothing to refer back to. Does that make sense? Ugh. Tomorrow we head to Stuttgart for a couple of days, and then fly home on Tuesday. I don't know what kind of wifi we'll have for the rest of the trip, so even though I am ahead with my paintings, I may not post again until Wednesday. I know exactly what you mean. I've tried it and get in a right pickle! I'm a firm believer in painting only what I see. The truth, the whole truth and nothing but! BTW delicious colours as ever!